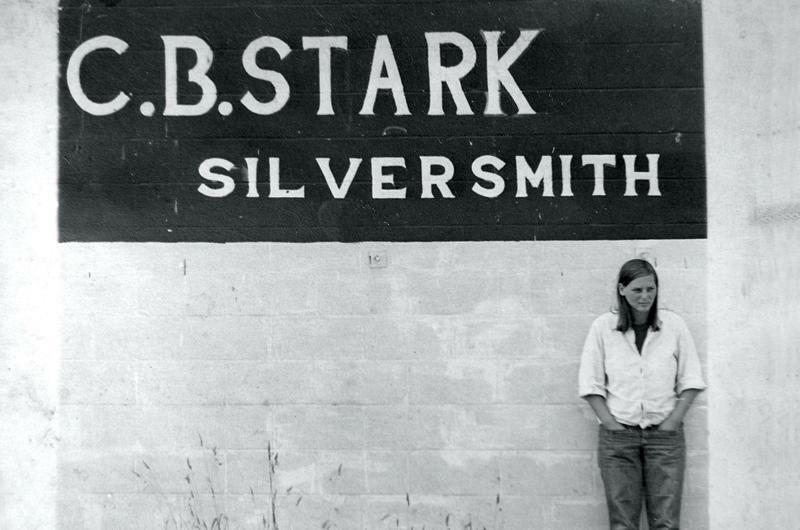 Cheryl Stark outside her first store in Vineyard Haven. 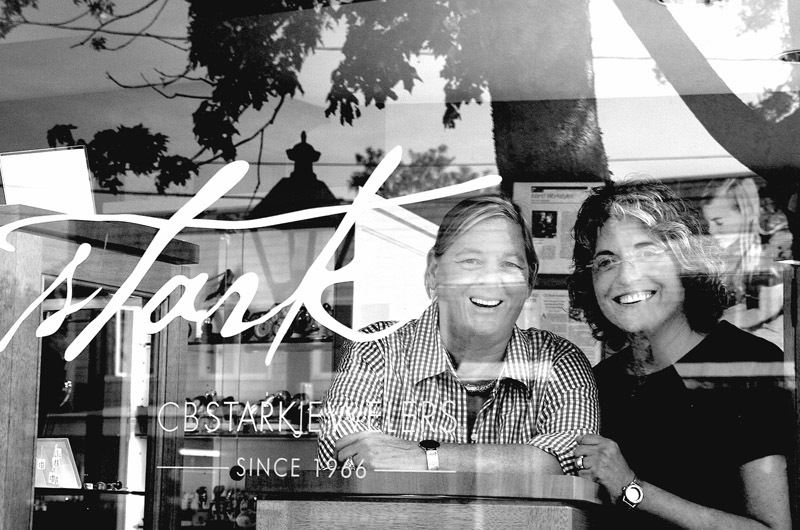 Cheryl B. Stark, the iconic Vineyard artisan and co-founder of CB Stark jewelry store on Main street Vineyard Haven, died Jan. 2 at her home in West Tisbury. She had recently celebrated both her 70th birthday and the 50th anniversary of the store. Ms. Stark and her longtime wife and partner Margery Meltzer. — Ivy Ashe/Gazette file photo. Cheryl Stark came of age as an artist during the counter-culture era on the Vineyard in the late 1960s and early 1970s. She later built a thriving year-round business enterprise with clients around the world, with her longtime wife and business partner Margery Meltzer. Born and raised in Scarsdale, N.Y., she first came to the Vineyard in 1966 when she was 19 and a student at the Museum School in Boston. She had taken a course in jewelry making and was drawn to silversmithing.“I thought I had found my thing. It was great,” she said in a September 2016 interview in the Martha’s Vineyard Magazine. She saw a notice on the bulletin board at the school inviting artists to Martha’s Vineyard. Ms. Stark worked in the craft center tucked behind the old Linden tree on Main street Vineyard Haven. She made a silver peace sign and later a bunch of grapes, presaging the charms that would one day become the bread and butter of a thriving CB Stark enterprise. After working a few summers on the Vineyard, she returned for good in 1969, opening her first store in a garage on Water street in Vineyard Haven, where the Black Dog Bakery is today. She met Ms. Meltzer, a musician and poet with a degree in philosophy, on the Island in 1972. They were inseparable, as a couple and as business partners. 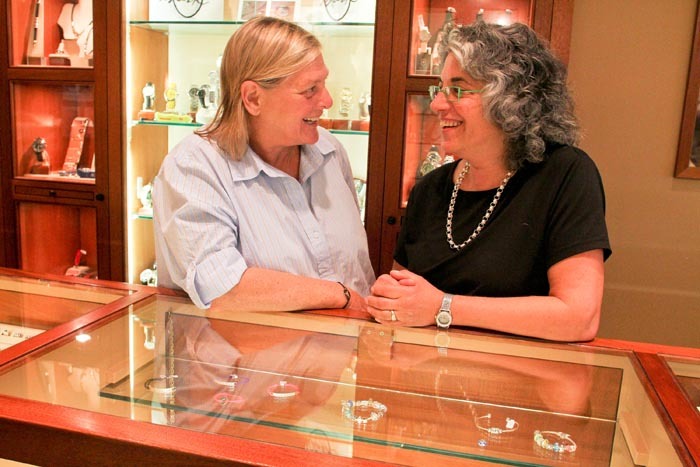 CB Stark jewelers has been an anchor business on Main street Vineyard Haven for decades. “You can’t make a living year-round on the Vineyard, but we have made the choice to keep our employees employed,” Ms. Stark said in the magazine interview. In late May the store hosted a small celebration to mark the 50th anniversary of CB Stark with cake and champagne. Ms. Stark turned 70 on the same day. A celebration of her life is being planned for the spring, and a full obituary will appear in a future edition of the Gazette. Donations in her memory can be made to the Martha’s Vineyard Hospital Infusion Services, P.O. Box 1477, Oak Bluffs, MA 02557. Arrangements are under the care of Chapman, Cole and Gleason Funeral Home in Oak Bluffs. Such a shock & loss to MV. Her store was always an initial stop for us on our bi-annual visits. She exuded the spirit of the Island. Rest In Peace and keep watch over the Island. You will be missed. I shopped in their store for over 30 years...I too have the iconic charms on a VERY full sterling bracelet. I TREASURE it, as it reminds me of ALL those Summers on South Beach with my children and family. Condolences to all C.B. touched with her heart AND artistry. Such a shock and a loss for all who knew her. I always said CB Starks was my place for 'Therapy' ~ she will be missed by many. Condolences to all ~ fly high Cheryl ~ you'll be missed but never forgotten. I went there a few times., I always as a craftsman like to see others work. It's a funny thing., we who are Artist have a brotherhood that we all connect., as soon as we find this out. It's very special and she had this in her being., I always no we are all on borrowed time and it's ends as we get old of just sick., The Vineyard was lucky to have her just like Tom Dumont of the Edgartown Scrimshaw Gallery., may they each one Rest In Peace . Her little shop with 3 sides and and open door to the street intrigued me as a 17 year old in 1972. I would spend hours coveting her amazing silver jewelry. I finally managed to afford a ring which I adored. Hard to believe she is gone. My sincere condolences to her partner and all her friends. Cheryl....you touched so many lives, not just as a master of your trade but as a loyal and wonderful friend...I will be forever grateful for the time i worked with you and for the love and support you and Margie gave my mom as she battled and lost her fight to cancer. One in a million...you will be so missed and cherished....Margie I am sending you a huge hun...love and prayers....God got another angel! Cheryl was a gifted artist and a lovely addition to the lovely island. We patronized her work and her store for 30 years and considered her a friend to our family. Her loss is sad. She will be missed. May God bless her soul. She is, I am sure, presently making a pendant for St. Peter. We will miss our dear friend Cheryl who embraced us 22 years ago upon our first visit to MV. CB Stark would always be our first stop off the ferry to catch up on the latest restaurants and island news. We express our deepest condolences to Margie, both of their families, Sarah York and the entire CB Stark family. Our lives continue to be enriched by warmth of their friendship. We have all lost a dear friend, but the island and the world has lost an amazing person. Margie, we love you and wish you peace and comfort at this difficult time. Bought my first box chain necklace there at the old location where the black dog is in 1983...we'll I think my mom bought it for me:) I bought many young ladies jewelry there and eventually my wife and I bought items for each other and our children. A Wonderful shop and two great ladies and business people. Your legacy will live on Rest In Peace and thank you for the memories. Very sad news. Stories like C.B. 's are the embodiment of what makes the Vineyard such a special place. We've been customers for years and hope to be for many more. Our condolences to family and friends. So sad to see the news. Rest in Peace Cheryl. I have many fond memories of our vacations on Martha's Vineyard and also the ten years we lived on the Vineyard until this past summer always stopping in at CB Stark's. I have several of CB Stark's original designed pieces and treasure them. My first purchase was the grape cluster of the Vineyard for my charm bracelet and through the years more special pieces. CB Stark has been my first choice for special gifts for family. Cheryl being available to chat and provide suggestions and information. She was a very nice woman. She will be missed. My sympathies to Margie and the entire family. In 1971 she forged a ring from a silver spoon for me for a gift for my mother . It sits on her jewelry box to this day. Cheryl was a dear friend from that point on. Cheryl and I met when we were both cocktail waitress @69/70 at the Rare Duck. She remained a reliable friend as her star soared on the island. She will be missed and long admired. So sorry to hear of her passing. Have lots of fond memories and jewelry from her wonderful shop. Cheryl helped John and I pick out our wedding bands we had such a Great time. God Bless ! Cheryl always had a kind word and thoughtful way. I will miss her smile and presence on the island. Everyone I know is very sad. I fell in love with Cheryl's jewelry on my first visit to the Vineyard over 25 years ago. Over the years I have acquired an embarrassment of riches from her shops, which I wear during the time I am away in America. Cheryl's talent will be missed. My condolences to her beloved partner. Jody and I always stopped by on our annual August visits to MV - such a wonderful place to obtain a keepsake memory each year. We will always remember her wonderful artistry. My family has been visiting the Vineyard every year since 1989. In December of 1990 our daughter was born. Her first piece of jewelry came from CB Stark. We have added to her collection every year. Cheryl was an artist's artist and she will be missed. Rest In Peace. So sorry and sad to hear this. What an amazing artist and woman. My thoughts are with her family and friends at this difficult time. CBStark and Cheryl, always on my list to visit when I'm on the Vineyard. The Island piece she made that I have from about 25 years ago, will be worn with her memory in my heart. Every trip I make, takes me through the doors of her shop, the only place I buy jewelry. I am most grateful to have known Cheryl - and extend condolences to all and her partner during this difficult time. Very sad to hear of Cheryl's passing. It was always a treat to go and browse the beautiful jewelry in her shop, and to buy something Special on occasion. She was such a nice lady. I have know Cheryl for many years and my jewelry box is filled with her wonderful pieces. I have always cherish my annual visit to the store to get my treasures. Rest in peace dear artist and keep a watchful eye over our beautiful Island. You were so much a part of everything Vineyard. So sorry to hear of Cheryl's passing. We met in elementary school and remained friends for many years. We shared so many fun times together. In 1969, she made beautiful wedding bands for my husband and me. She will be remembered with much fondness. My thoughts are with her family and friends. Cheryl became a great fiend and confidante to me over the years. John, Katie and I adored both she and Margie. A stop in the store might last hours. A man shopping for his wife in muddy boots never bothered the CB gang. My bracelet holds a very special charm CB found for me to join all of her gorgeous charms on my wrist. I cherish her thoughtfulness and its beauty. The last time I saw Cheryl (about a month ago) we sat on a couch together, she reached over and held my hand during that whole hour. Never ending knowing kindness. She loved the fact that I thought she looked just like Sharon Stone when it came time to cut and change her hair. Infectious ... that laugh ! This is such sad news. Going to CB Stark has been a family tradition since I was a kid with my mom, then with my husband when we first married, then with my daughters. It bacame an annual event to go a choose a new charm for my bracelet every summer. Our sympathies to all. Wendy Arnell Brophy, Tisbury, MA. The neighborhood will never be the same Cheryl! There is not a place on-Island where you won't be missed. Blessing Margery. My heartfelt condolences to you Margie. I am a very close friend of Pete and Lil Johnson and fell in love with your jewelry for decades and though could not afford the higher end Cheryl always made me feel very special when purchasing your beautiful charms and earring. Lil had given me a hammered silver/gold bracelet which I wear every day. I wear the seaglass hourglass each day as well. I am so sorry for you loss, you two have had a long inseparable relationship with much love much that most people never find. No visit to the Vineyard was complete without a visit to C.B. Stark in Vineyard Haven. I purchased two charm bracelets (for me and for my daughter) over 14 years ago. I once was assisted in the store by Cheryl who asked me why I didn't have an Inkwell charm - "I made them for you", she said with a smile. I promptly bought two and we wear them proudly along with other jewelry pieces from the store. She will be missed! Dear Margie, I can't tell you how very, very sorry I am to hear this news! I have so loved my yearly visits to your shop since 1978. I love my annual charms to celebrate each year. But most of all, I will miss talking with you both together & laughing. So many wonderful memories. I couldn't believe how you both make everyone feel at home & beloved. Sending you love, Margie. I'm saddened to hear this news, and send my sympathy to Margie. What a great loss for us to absorb, the passing of an intelligent, talented artist. I treasure my C.B. Stark creations. This is such sad news and we agree with so many others who have written how another great person has been taken from us far too soon. The first piece of jewelry I ever purchased was from Cheryl at her "old" store in VH in 1975. As fate (and very good fortune) would have it, Cheryl became a good friend to my wife and me many, many years later as a result of her friendship with my mother, Sue. In her inimitable way, Cheryl brought out the best in my mother, made her laugh at the simple things we all experience in a given day and made her feel valued as a friend. For Cheryl, it was simply doing what she did so often, for so many and without pretense. We will never forget Cheryl "holding court" in the middle of Main Street in VH as she chatted with us during what turned out to be my mother's last trip to the Vineyard. It meant the world to all of us. Margie, we grieve with you and hope you will find comfort in the knowledge that you made Cheryl's life better each and every day until her last day. She always lit up when she talked about you whenever we saw her and our bet is she is still doing it now! No question we are better for having known Cheryl and we will keep her spirit alive in the days and years ahead. I was a CBStark customer for forty years, but only met Cheryl five years ago. What a unique and remarkable woman. While she had an immense following of grateful customers and a wide circle of friends, she was truly a saving grace for those who needed her the most. She will be sorely missed, and never forgotten. Rest in peace, Cheryl. I'm in shock. The Island will never be the same. Cheryl will be missed by so many. My deepest condolences to Margie, the CB Stark crew and all who loved her work, and her. While I never met Cheryl her jewelry is a rare reminder of the wonderful artist she was and will always be in the hearts of all who frequented her stores while on MV. My condolences to her partner, friends, family and staff. I worked for Cheryl, in the Edg store, for two years. She was very good to me. I won't ever forget her. Rest In Peace my friend. In the summer of 1974, Cheryl hammered a silver bracelet on the arm of the man who, the night before, had proposed to me. He is now my husband of 41 years and the bracelet has never been off his arm. Cheryl, whether she knew it or not, was part of our story. Over the years, some of my best presents came from her wonderful shop and my daughter wears a beautiful engagement ring of family stones that Sarah and Cheryl helped design. She was also a good friend to my dad. The Bryan family will miss her. Although my sister, Elaine, and I never get to the island as often as we wished, I always bring her to CB Stark to get a "little treat" as a remembrance of our time together. Cheryl will certainly be missed yet her goodness and talent will always remain with those she touched. Margie, know that she has left your side physically , yet Cheryl will remain with you always in your mind and heart. Margie, please accept my sincere condolences. I first met Cheryl in late 1972 or '73 when I was making the rounds, soliciting advertising for the Vineyard Gazette. Cheryl was in her shop next to the Black Dog. I met you about the same time when you worked on Fridays at the Gazette as an "inserter". I feel I go back a long way with you both and I have tried to say hello whenever I could drop in to the jewelry shop. I will miss Cheryl and hope to see you when I'm back on-island.. I treasure my flip flop earrings and multi shell bracelet, my first purchases at CB Stark on my very first vacation on MV. The shopping experience is always pleasant and the items unique and oh so local. I also have the Black Dog charm along with some others that I love. thank you Cheryl for being a part of the heart of the island. Condolances to your family and friends. Peace on your journey. I feel such deep sorrow hearing of Cheryl's passing - she will be sadly missed by so many people. Starting in the early 1970s and for over 30 years, we summered at the Coastwise Wharf, just steps away from the shop at Five Corners. I vividly remember getting broken cookies at the back door of the bakery, and watching Cheryl and Margery make jewelry. For nearly 40 years I've worn the bunch of grapes ring my mom bought there, and I treasure every charm collected over the decades since - beautiful embodiments of a magical place, forever close to my heart. She was a force of nature and through her and because of her, I remain forever and daily connected to my priceless, treasured childhood MV memories. My condolences for a great lady, to all who grieve for her, to all who were lucky enough to know her, to all who treasure her artwork, and to all who will now celebrate her life and legacy. May her memory be a blessing and a comfort. Sincere condolences to all who knew and loved Cheryl. We had a produce stand one summer next to Cheryl's when her store was in the garage that is now the Black Dog. It was an incredible time, so vibrant and close. We stayed distant friends, always a glad hello when we met. I will miss her, knowing she's not there anymore with her big smile. Not a summer has gone by for over a decade that I haven't gone into the store and purchased a beautiful charm for my bracelet and added a piece of wampum to my collection. One of the great original keepers of island artistry...part of island history. Thank you for all the keepsakes of beautiful memories you have created for all of us who love this island. Peace to you and your loved ones.